Akhtawar, is a 19 year old artisan who dreams to become a professional handicrafts manufacturer. Belonging to Raeem Dino Thaeem village in Thatta, Akhtawar lives in a joint family system, with eighteen members living in one house. Five of them her own siblings. My elder brother is a teacher at a private school located in Bello City. He earns PKR 1500 (US $ 15 approx.) a month. He is also a member of the Gender-based violence (GBV) and Sexual and Reproductive Health (SRH) theater groups formed in our village. He earns PKR 1500 per day for his performances. Our father is an agricultural farmer, harvesting crops including wheat and rice. He owns the land but buys seeds on loan as he cannot afford to buy them. This way the loan is returned in the form of harvested crops. Most of the harvest is given to the seeds seller in order to repay the loan. Community World Service Asia’s and Christian Aid’s livelihoods project came to Raeem Dino Thaeem village with an aim to empower the local women and assist them in earning a better living by enhancing their inborn skills of stitching and embroidery. To initiate the project, an assessment test was conducted to select artisans for the vocational trainings. Many women from the local villages took the tests to be selected. 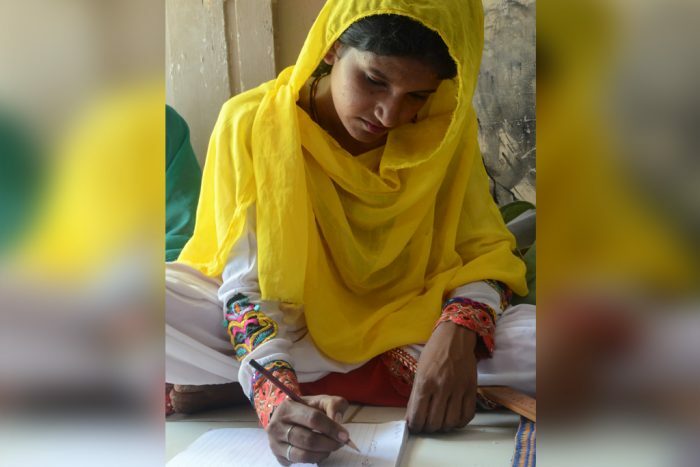 Akhtawar was amongst those who passed the assessment test and was selected as a participating artisan under the enhancing livelihoods project in Thatta. The three month Adult Literacy Training enlightened many uneducated women in the village. I passed my matriculation but some women at the centre had never received any schooling since their families could not afford it . They could barely afford their household and medical expenses. The literacy training enabled the artisans to learn basic Mathematics, English and Urdu. Many of the artisans wrote their names for the first time in English. My aunt also received the literacy training and she used the learning to teach her own school going children at home. I also teach my younger brother and sisters. I even teach my mother who learns as eagerly as my siblings. My uncle was so pleased to see how well we read and understand the course books. Before the trainings, Akhtawar stitched clothes at home without the use of any sewing tools. It was at the skill development training that we learnt to use sewing tools. We usually measured the clothes directly on the body and cut accordingly. Therefore the fitting of the clothes was never accurate. We learnt to use measuring tapes at the skill development training at the center. The quality of my stitching and apparel fitting improved immensely. On the other hand, we learnt new designs and threadwork which enhanced our embroidery skills bringing variety to our work and increasing its value. Akhtawar has received many personal orders from neighbours and other residents of nearby villages since she graduated from the training centre. Young and determined Akhtawar has already worked on completing orders for some of Pakistan’s famed fashion designers such as Shayan, Imrana from Indus Valley Schools of Arts and Architecture (IVS), Habitt, Najia and Nida Azwer. I have earned an estimate amount of PKR 8000. My mother is ill and requires medicines at all times. After some tests, the doctor told us that my mother’s brain is weak and prescribed some medicines. The expense of travelling to the hospital in Tando Allah Yar and tests were all borne by me. This made me very emotional as I never thought I would ever be able to help my family this way. In addition, I also paid the admission fees of PKR 1000 for my brother’s English Language course for which he travels to Bello City. I also contribute to his monthly school fees which of PKR 500.
he crops we harvested or the money earned through the sale of the crops was mostly paid off in loans, so very little was saved for the family to use. The vocational center enabled me to contribute to my family of eighteen members. I proudly contribute in the household, education and medical expenses and my parents and siblings are pleased with my growth and financial independence. Akhtawar’s elder brother and sister, Rahim and Bakhtawar, are members of a theater group as well which performs to raise awareness on issues of SRH/GBV. Initially my father did not support the idea, but when he attended some performances and witnessed the change in the rigid minds of many villagers, he too supported my siblings in their work. Many men in these communities are conservative but many have gradually started engaging and participating in the theatre plays as performers and spectators. I watched the first theater performance in November last year when the group performed in our village. The men in the village were surprised to know how young girls’ health are badly affected by child marriages. They were not aware of the health and mental issues a young girl goes through when married early. I was astonished to see the change in men when they refused to marry their young daughters after watching these plays. Today, many encourage their daughters to join schools or vocational centers in order to build a better future for themselves. In addition, mothers’ consent started being taken before entertaining marriage proposals for their daughters. Both of Akhtawar’s parents fully support their children in actively participating in activities that are helping to bring positive changes in their community and society. Akhtawar shared that girls in her village did not travel faraway places for any reason. My father permitted Rahim and Bakhtawar to attend the SRH/GBV training in Hyderabad for 10 days. He encouraged them to bring back knowledge and new learnings which will enlighten the conservative minds of the villagers. Ali Hassan (Akhtawar’s father has been supportive towards bringing positive change as he believes in educating people who have not been fortunate enough to gain such opportunities.